Memento mori Pompeii mosaic (30 BCE - 40 CE). 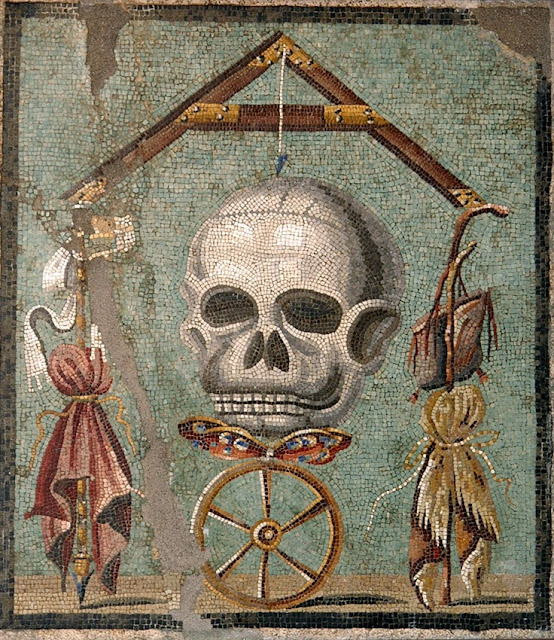 Image Source: Ancient Rome. In June 2009, economists declared that the Great Recession ended. But to many people, it still does not feel that way. Perhaps that is because the global economy is undergoing a painful transition. The gears are grinding, but there is no sensation of everyone barreling forward. Progress reports coming from tech sectors are deceptive: the virtual economy massively expanded over the past twenty-five years. High tech computing - with hardware's planned obsolescence and non-physical wares like Facebook acquiring value, based on the marketing promises of Big Data - pumped up bubbles around illusions of productivity. Financial speculation in the 1990s and 2000s depended on the exponential expansion of our ability to speculate. 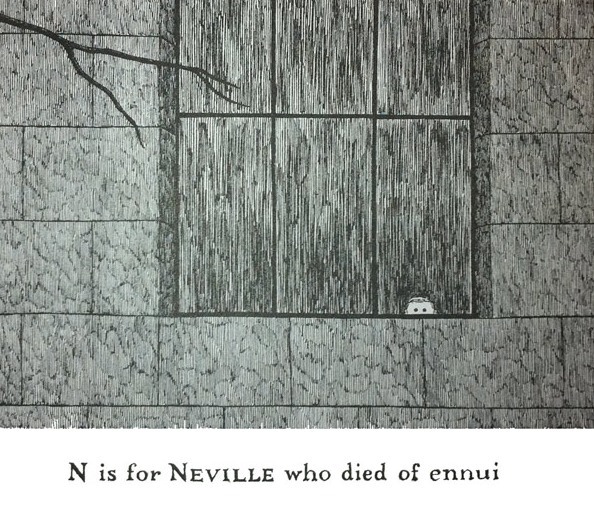 From Edward Gorey, The Gashlycrumb Tinies (1963). Image Source: Satori Stephen. I also know I'm not alone in struggling with this problem--which is why I was doubly pleased to discover this blog post by ShelfTalker's Elizabeth Bluemle. She spoke with a number of writers about their distraction-circumventing techniques, and got some fascinating responses (it's really interesting how many writers move to a different spot, or use a different computer). She also links to a program called Freedom, which lets you block the Internet for up to eight hours at a time. You can disable it once you've set it--but you have to re-boot, and, theoretically at least, "the hassle of rebooting means you're less likely to cheat." I was reminded of my early posts on shortening attention spans and procrastination, here and here. This is the problem of time bleed, caused by overexposure to tech and the Internet, which erodes our days. But what interests me more is motivation and emotional responses to time as they relate to Cyberspace. One commenter on the Writers Beware! blog felt that procrastination results from fear. But there is something larger to this if people feel so helpless that they can no longer turn off the Internet by themselves and need a program to do it for them. Web surfing no longer constitutes procrastination. It's become part of living. The idea that the time we spend on the Internet isn't 'real time,' or 'worthwhile time,' or is 'wasted time,' hails from the early 1990s to the mid 2000s, when the Web was still a novelty and contrasted with 'real' activities. 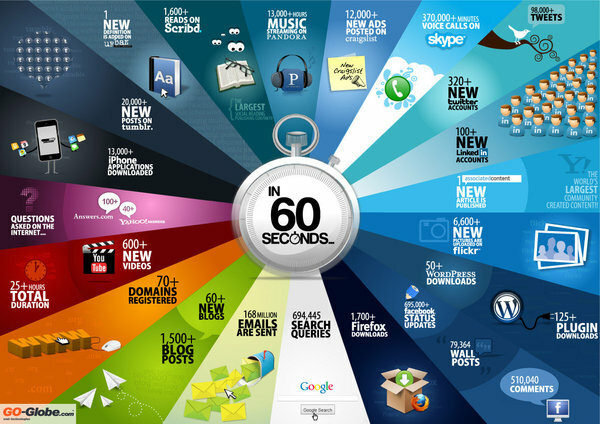 What happens on the Internet every 60 seconds. Image Source: Shanghai Web Designers via MSNBC.